Heyo! How was your weekend?! It’s been a one-thing-after-the-other kind of life lately – just the way I like it. Last Wednesday, I hopped on a flight due East, and joined many amazing bloggers for a Tour de Sabra’s Factory in Richmond, Virginia. I’ll give you a full recap soon, but for now, let’s just say the whole trip was a wonderful experience. I arrived home late Friday night, then hit the trails biking on Saturday. Then proceeded to hit the trails running on Sunday. …And proceeded to brag about all of it on the InstaGs. …Because if a tree falls in the woods and no one was there to post a picture of it on Instagram, it never happened, right? Thank you for bearing witness to my life. ALSO, somewhere between flights across the country and testing all of Sabra’s hummuses with my head hole, I turned the big twennyNINE. <- said like Schmidt from New Girl. And now I feel like I owe you a blog post about the 29 Things I’ve Learned Thusly, or tell you the 29 Must-Own Items That Will Make You Appear 21 When You Are, In Fact, TwennyNINE, or 29 Ways to Open a Bottle of Wine Without a Corkscrew, 3 of Which Totally Work. Etc. But let’s face it, I’m probably not going to do any of that. But I will continue to drink milkshakes like it’s my birthday, because: calcium. 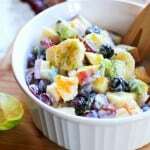 Up until making this recipe, I always thought of fruit salad as just a fancy and fantastic excuse to eat Cool Whip and marshmallows. Duh-licious. I admit, I’ve always loved this classic concoction but haven’t considered fruit salad a big life To Do on account of…well…the Cool Whip…and possibly the marshmallows. But mostly the Cool Whip. Clearly, it didn’t dawn on me that there are no Fruit Salad Rules to follow, until it did. 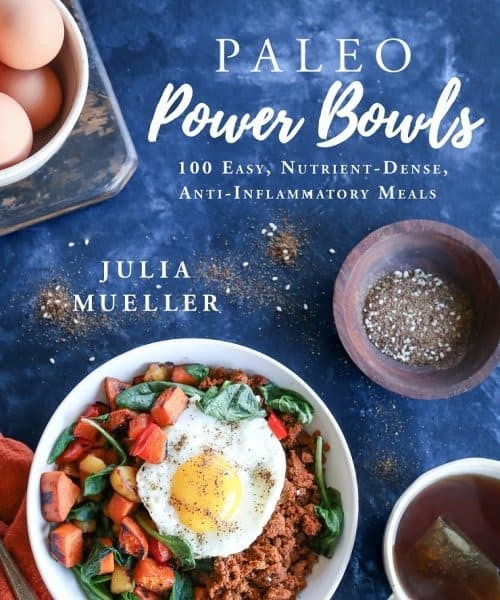 At which point, I was all, “What in the hay fever, Julia, how come we’ve never made fruit salad ever in the history of our lives?” <- I’m allowed to refer to myself as, “we,” because as already mentioned, I’m a Gemini, which means I’m more than one person in real life. Here’s how it happened: I had all sorts of frutas in my refrigerator, along with an open can of coconut milk, yogurt, and basil (so, like, all of the ingredients…right there in the ice box). I took my whozits and whatzits galore, scrambled them up in that over-sized ramekin you see in my photogs, and created a healthy fruit salad with a ridick amount of flavor. The lime zest, the basil, the coconut, oh my! It’s a bombardment for your taste buds, and oddly reminiscent of a Peter Gabriel song <- roll with it. You can make this salad your own by incorporating your favorite fruits. If, by happenstance, you’re a big fan of the melons (the eating kind, not the thinking kind), this would be a great place to put them all. You can also use mint instead of basil, or make coconut whipped cream in order to make the dressing uber thick. 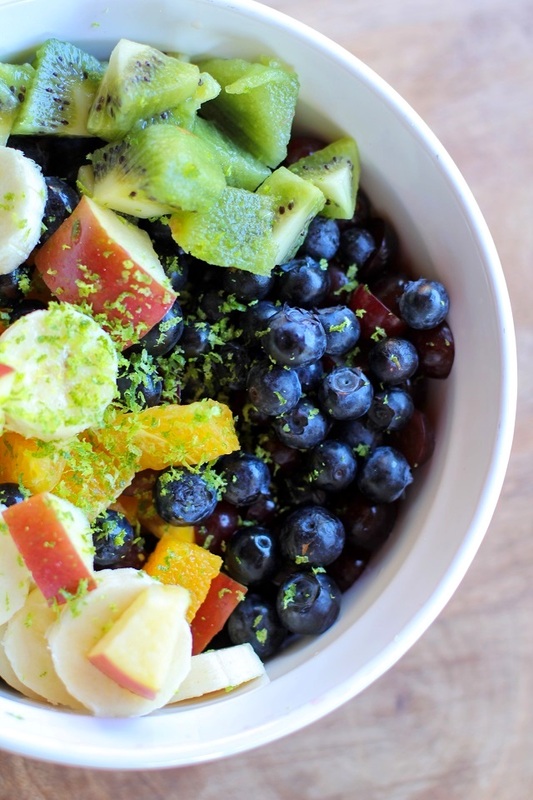 Add all of the fruit to a large serving bowl. In a small bowl, whisk together the coconut milk, yogurt, basil, and lime zest. Pour the coconut milk mixture over the fruit and toss everything together. Drizzle the honey over the fruit salad and serve. 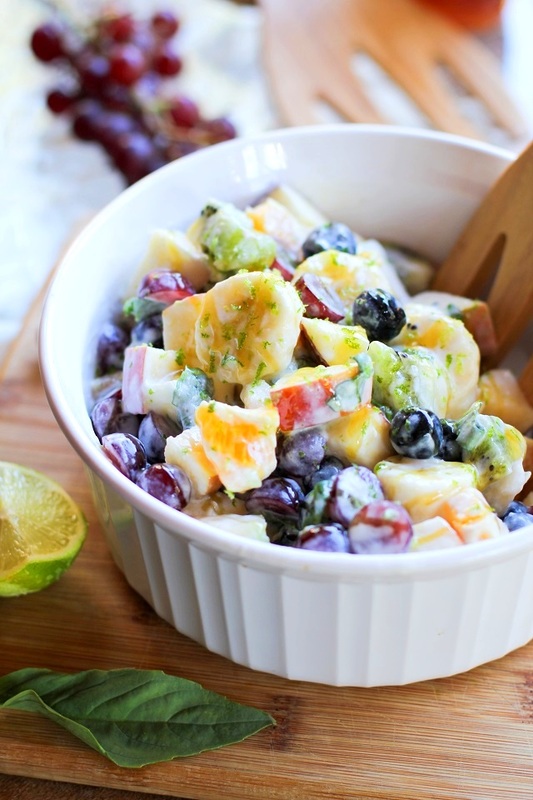 Love this fresh twist on fruit salad! Thank goodness there are no rules to salad — just fun! 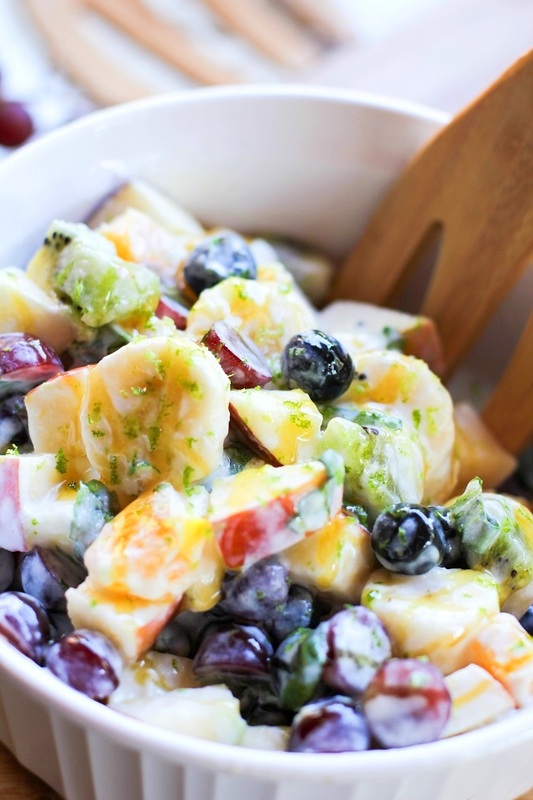 I think the stars aligned for you and this fruit salad because it looks like the best thing EVER. I love that you used coconut milk in place of that marshmallow garbage. I bet it would be a yoooge hit at a potluck but I might have to make it just to have all to myself! We got to taste test this salad, and the basil flavored the salad in the most amazing way. This is a salad to serve when your BBQ with friends or want something a little different to impress! Coconut milk?! Now I am complete! You are a busy bee girlfriend and happy belated birthday! You deserve all the bike riding/hiking/milkshakes you want because–> balance (also birthdays don’t count for calories, righhhht?!). Happy Birthday from a fellow Gemini! I definitely agree that we have the prerogative to use the royal “we”. This fruit salad looks amazing!! I am a sucker for fruit salads. That coconut milk really takes this one over the top for me. I love all things coconut! And Sabra was amazing. I am so happy that we got to hang out and get to know each other better off of the Internet! 🙂 Cheers to more healthy fruit salads like this one! THIS LOOKS SO EASY–I love. I would enjoy hearing your 29 ways to open a wine bottle without a corkscrew because I YouTubed it once and it was a total fail. Happy belated! what the what! Happy Birthday!!! Dang we should have toasted to you. I’m all heart eyed over this fruit salad, looks amazing lady! What a beautiful Summer salad! I love the addition of coconut milk, so clever! This dressing = genius. Also, happy birthday girl! I saw that on the old FB. Glad you had a fun birthday. 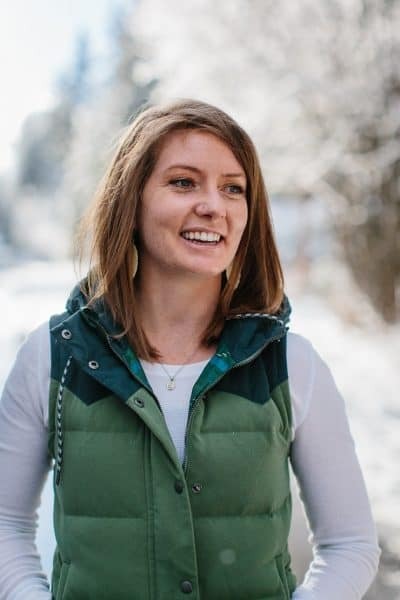 And PS – I’m going to be 35 (yikes!) on Friday, so 29 is looking YOUNG. Whew! Belated happy, happy birthday!! I’m also glad you got to have a good visit in Richmond. I lived there for about 20 years and really loved it (I only left because I got married to a man who lived about 2000 miles away). This fruit salad sounds great. I think I’d do it with berries and melons (for summer) and the way you have it for winter. I love the use of lime zest and basil – the basil is an excellent unexpected ingredient. I love this version! I never put a sauce on my fruit salad, but it sounds delicious! And now I’m singing the song from Little Mermaid. While wanting fruit salad, which I don’t think she got (until maybe after she married the dude). Happy belated birthday, fren! I hope it was fantastic and filled with all of this yummy fruit salad you could ever want (and booze. Obvi). Yum! This sounds deliciously different! I love the use of basil and the creamy coconut milk! Bahaha – we’re soul sisters – we BOTH talked about cool whip in fruit salads this week;) This coconut milk + BASIL fruit salad looks amazing and totally puts any cool whip salad to shame. Bring this to a potluck and you’ll find me with a fork over the bowl. Happy belated birthday! Why wait for your birthday to drink milkshakes and eat cake when you can do it every day? Ya only live once, right? Well, at least that’s my theory. 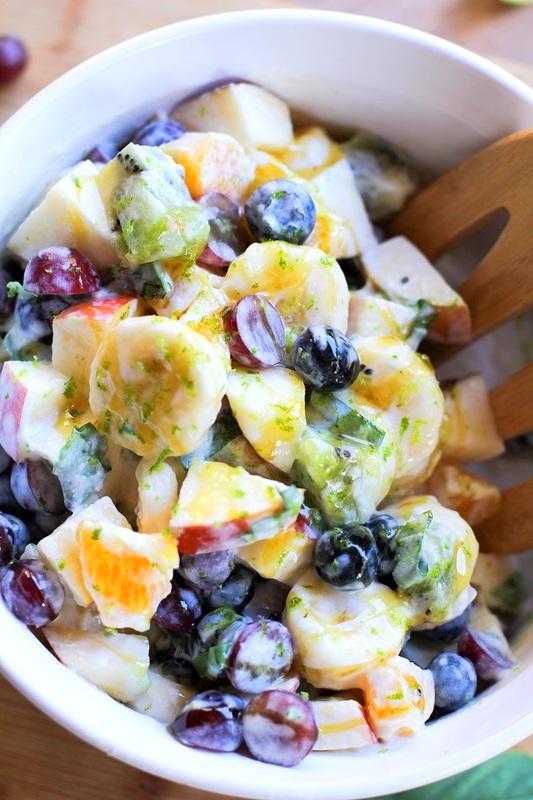 This fruit salad is proof that not all fruit salads are alike. Did you know that the Interweb loves fruit salad… Love it! I must say, this is the best one I’ve seen by far. i dont make fruit salad as much but in Nepal, it is often served as a dessert. it is sweetened with honey and yogurt. i love your version with basil and coconut milk. Sounds like you had fun at your trip to Sabra!! I can’t wait to hear more about this trip. Ju, are you 29??!! So young. I’ll be 34 this year 😉 Happy belated birthday, friend! This fruit salad looks absolutely delicious. I love that you used coconut milk in place of that marshmallow. Pinned! Touring a hummus factory sounds like the most amazing way ever to spend your birthday!! I would have demanded a cake made out of hummus 🙂 Happy Birthday! I’ll be turning 29 this summer too and I’m not super thrilled about it but I guess it had to happen sooner or later! I was just thinking the other day how I don’t think I’ve ever made a fruit salad before! Crazy, I know! This looks like the perfect one to start with because I love me some coconut milk! Happy belated birthday, girl!! I feel like we have similar fridge situations right now. Odd fruits and a tiny bit of coconut milk and a sliced lime. Love these dee-licious things that are going on in this salad! Also, I’m going to turn 29 later this year, and I’m going to write a 29 things to do before I turn 30 list!!!! Just kidding, I know I won’t. I often feel like, if I exercise and don’t post it on Insta, do the calories burned even REGISTER. I hope so, because I really don’t post the majority of my workouts. Yikes. I want to fill my life with ALL THE FRUIT SALAD at the moment. THIS DRESSING. Hubba hubba. I throw coconut milk on everything and somehow fruit salad hasn’t crossed my mind until now!! Looks and sounds DELIGHTFUL. So light, refreshing and a little creamy action too?? Perfect! So glad you like it, Alison! Coconut milk really is a winner in the versatility and flavor realm! Love how quick and simple this salad is. A great idea for a healthy breakfast. Go healthy go smarxy girls!